Asserting a chic and sophisticated vibe is the Poppi Low Side Table in black wicker. 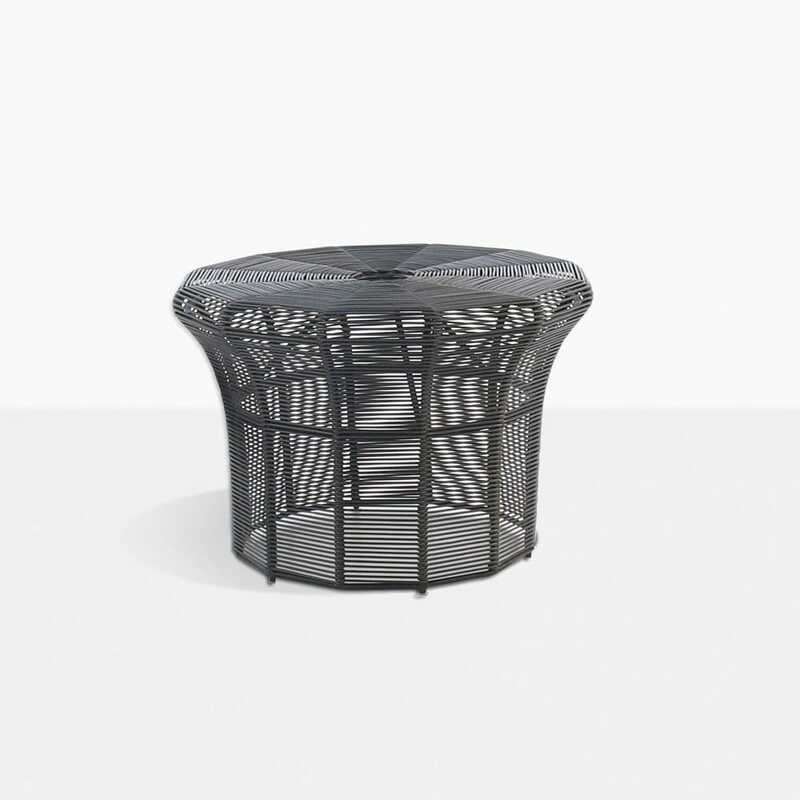 A wicker table that has a beautiful design, the Poppi Side Table is inspired by turn of the last century outdoor furniture, this gorgeous accent piece is not only elegant, but boasting amazing modern materials, the Poppi range of tables are an amazing addition to any space, giving it the lift it needs to become a welcoming, tranquil area of divine proportions. Alongside the Poppi Low Side Table is a Higher version, as well as the Poppi Coffee Table, so you can create a cohesive and dynamic setting in your very own outdoor area! Each of these amazing tables feature a large, flat circular table top that is augmented by a lovely flared base, showcasing the stunning woven wicker. Wanting to create a bit of texture and warmth to your deep seating set? Place a Poppi Low Wicker Side Table on either side of your 3 seater Teak Sofa, and enjoy a welcoming area that is a continuation of your at home living space! Don’t discount these gorgeous pieces for indoors! The Poppi Low Side is a wonderful table to place in your entrance way or in the sitting room! The Poppi Lava Wicker Collection is built on strength, beginning with the powder coated aluminium frame, that resists erosion, then woven on to it, the incredible outdoor wicker, through dyed and UV treated for optimum outdoor use… because we know with extreme style must come extreme quality. And we believe in choice, so as well as the different styles and sizes on offer, Poppi also comes in a chic White colour, meaning that you can create an area that suits your taste!